Pell City had two conspicuous sites where Field Day activities were held this year. 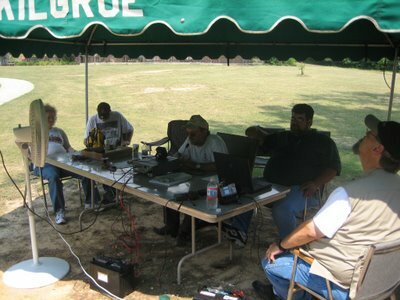 This photo is from Pell City Lakeside Park where the St. Clair Amateur Radio Emergency Service set up. They are not really a club, and they do not charge dues. However, they do volunteer to provide communications when emergencies arise. Field Day is a fun way to practice and to get a little public awareness. If things look a little slow in this picture, it is because the HF Bands die down in the middle of the day. Next time you pass through Pell Cty (my QTH), be sure to CQ or call N4FCP on 2 meters.